Comments or concerns welcome:Let us make it right. 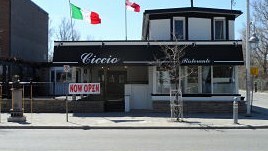 The tradition began in 1974 when the Eramo family opened its doors to Ciccio Restaurant at 330 Preston Street in Ottawa. Ciccio came from humble beginnings as a small, cozy dining room to an elegant and upscale interior with three modern dining rooms. Ciccio has strived for almost forty years to maintain their authentic Italian dishes while embracing new and innovative ideas. Ciccio has, since its origin been identified as one of the finest authentic Italian restaurant in the Little Italy. Surrounded by other restaurants, Italian groceries stores and other Italian stores, Ciccio restaurante proves to be an absolute success and quickly distinguished itself for its unique Italian cuisine and innovative decor, making oneÂ’s dining experience an intimate and a memorable one. Ciccio Restaurante has become a favorite of working's locals as tourists to the area who enjoy fine Italian cuisine and excellent service. Since its inception, the cuisine has evolved to its present high standard of quality, consistency and innovation. Our cuisine is based on authentic Italian tradition updated by the unique culinary design of our chef. Historic location, beautiful decor, and great food, make dining at Ciccio a "gastronomic experienceÂ”. We are the very proud Owners of what has become one of the best and well known Italian Restaurants in Ottawa. We are also very proud to own and run our Ciccio Restaurant in the Corso Preston, Little Italy in Ottawa for nearly 40 years.